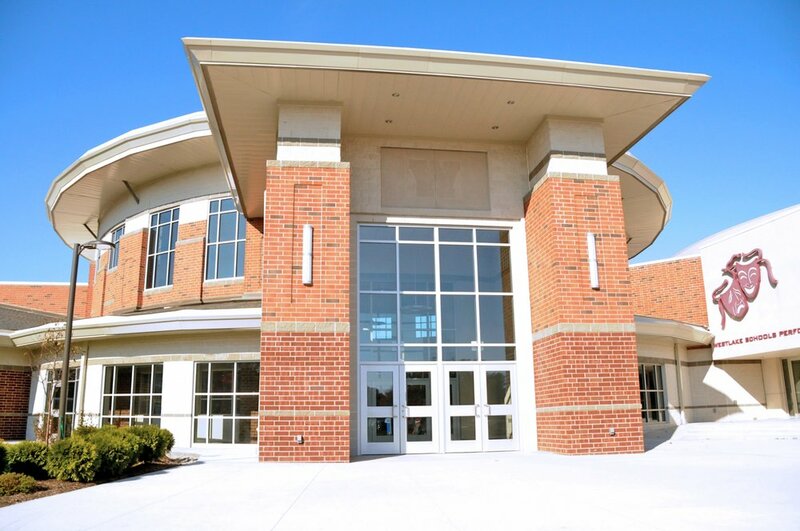 The Westlake High School accommodates 1,380 students grades 9-12. This state-of-the-art facility is designed meeting the LEED Silver Certification Level and includes many energy saving and environmentally friendly features. The exterior of the building marked by its horizontal lines, low-sloped hipped roofs, and large overhangs are reflective of Prairie-Style architecture. The main entrance to the building feeds directly into a large rotunda. This space with its abundance of natural light serves as commons/cafeteria area and anchors a focal point of the building design. Academics, Physical Education, and Performing Arts areas all radiate from this central hub. The academic area of the building supports the districts educational philosophy and is structured around five areas of curriculum, each organized by department. The media center is centrally located between the academic wings and the Rotunda.